What does Epic Fail mean? Director Pedro Chaves takes the hot seat and tells us all about his new movie Reiki! Tell me about Reiki the Movie; what’s it about? 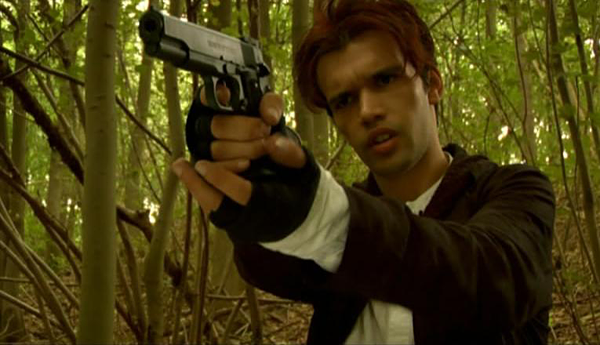 Reiki is a low budget action-fantasy feature film from Belgium. It tells the story of Vann and Hansel who awaken in a destroyed factory in the middle of nowhere with no memories of who they are… EXCEPT flashbacks from 400 years ago! During their exploration of the factory they meet Reisha, a girl who’s been running away from a group called “The Order”, witch-hunters that have been hunting witches since the dawn of time. Reisha tells Vann and Hansel that their flashbacks are true, they are memories of their past lives! Now Vann and Hansel must try to figure out who they are, why they awakened in this forgotten place, and survive their fight against the Order whilst protecting Reisha! Sounds Exciting! Now, (if it’s not too much of a spoiler) why is the film called Reiki? Isn’t that a kind of massage? Yeah, I heard that Reiki was a kind of Japanese massage; funnily enough when we started production nobody knew and it was just afterwards that some people told us. Actually there are some things alike between the movie Reiki and the Reiki massage (though very small). Reiki is the name of the sword in the movie. The Reiki sword is a special sword that can cut the astral line of a human being, which means when a person is killed with the Reiki sword they won’t be able to reincarnate anymore, thus they meet a true and absolute death. The name of the sword has an hidden meaning, but if I told you it would be a huge spoiler! Man, if that sword were in a D&D campaign it’d be EPIC yet at the same time very, very scary! Ha ha. Any chance of me getting a hold of that Campaign? Of course! I’ll tell you when it’s ready. I read that Reiki was filmed in only ten days. How did you manage that? Oh god, that was awful! Normally the shooting schedule is three weeks, but the company providing us the material dropped us last minute and thus due to a low budget we only had 10 days! Which means storyboards into the trash! Schedule into the trash! We had to shoot quick, and I had to handhold the camera the whole time to capture the moment and improvise the moment itself! And the the shooting schedule: we woke up at 5 am, started at 8 am with shooting until 2 am and then 2-3 hours of sleep! And all that for 10 days! I spent more than 48 hours awake at a time! Deadly I tell you! But it was lots of fun. I mean, shooting an action-fantasy feature film, low-budget or not in just 10 days is close to the impossible! But when you see the trailer we are very proud of what we achieved! There’s some cool fighting in your trailer. Were all your cast experienced in stunt combat? Far from it, most of the actors didn’t have any martial arts experience, so we had lots of training in my backyard, that you can actually find on youtube! And they’re pretty funny! There was extensive training, since most people didn’t have martial arts training, I couldn’t create a choreography for a Jet Li or a Jacky Chan, so the choreography is all adapted to what the actors can do! And I think that’s one of the reasons it works! Most Belgium films are subtitled. Why did you decide to film Reiki in English? This was a choice made for two reasons: First, it’s because if the movie is in English it will appeal to a larger audience and more people will see it! The second is because in an action-fantasy film, English is one of the languages that sounds the best! Especially the one liners! Aside from being able to speak English what did you look for in your actors during casting? When you are doing a low budget movie, you are a little limited by the choice of your actors, specially in a country like Belgium, where the movie industry is not as developed as in the US. If I remember correctly only 14 people showed up for the auditions, and most were women, while there was only one female role in the movie! So I wrote extra female parts and we took 13 out of the 14 people who showed up. What happened next was this: I looked at the actors available and rewrote the screenplay with the actors that I had available. So instead of working in the classical ‘screenplay – casting’ it went ‘casting – screenplay’. And amazingly it worked pretty well, some actors such as Martin Swabey or Davide D’Urbano give an amazing performance. That’s very innovative. What projects have you worked on other than Reiki? I remember Stephanie Carswell (Reisha) from ‘How Do You Solve a Problem like Maria.’ Will she be singing? Of course she will be singing! You cannot have Stephanie in a movie and not use her amazing singing talent! I wrote a singing scene specially for her. So, yeah, it’s not only a action-fantasy film, we also have a Disney moment! When will Reiki be released? I still don’t have the dates for the UK release. The Belgium release is soon. In the meanwhile I do know the movie is online somewhere on the net to download already. Do you think the Internet is revolutionising the Film Industry? Mmm, I wouldn’t call it a revolution but an evolution! If you see how VOD (Video on Demand) sites are growing, it’s amazing. Problem is though, the spam of those kind of sites. Youtube is great for small videos, but there should be a youtube for series and one for only movies. Until then the search for a place to view movies will be tough because of the huge amount of offers. Okay this is the last question and it isn’t really a question. This is open mic – Your chance to say anything else you want to say about Reiki. Reiki was a huge challenge where passionate people joined hands to create something beyond our dreams. And for that I wish to thank all the cast and crew members of the movie and all the support we received from festivals. And if people are curious about the movie, the release will be at the end of March. Thanks for the great interview and I hope most people will enjoy the movie, ‘cos in the end, it’s a movie to make you laugh, cry, feel better and forget for 87min the reality of our world and to step into a entertaining world. Liked it? Take a second to support Epic Fail on Patreon!